It’s a running joke in my Revolutions class that I have a little history-crush on Peter McPhee – one that I do all I can to play up, in all honesty. Robespierre has not, however, been my particular revolutionary crush; that’s Danton. After reading this biography, I’m half tempted to switch my allegiances… but the larger than life Danton is still more alluring than the somewhat severe Robespierre. Anyway, this biography is exactly what I was hoping for. It’s clearly written and easy to read; I don’t know accessible it would be for someone with zero knowledge of the revolution, but I’m no expert and I had no trouble following it. 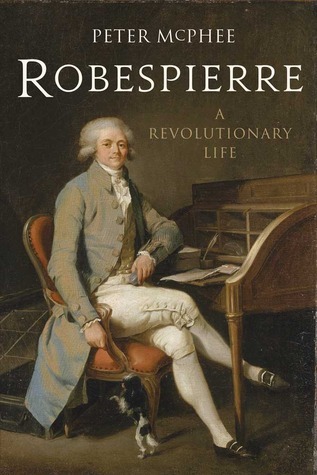 It follows Robespierre’s life chronologically – indeed giving a bit of background on his family too – and provides what felt like an appropriate amount of background and contextual information on the realities of life throughout France, reasons for revolution, and attitudes among different groups for the duration of said revolution. I’ve not read any of the other numerous biographies of “the Incorruptible,” and McPhee gives an interesting overview of them in his final chapter. I know that some have tended towards utter condemnation, but I didn’t realise that others turned into panegyrics. This one certainly comes down largely in favour of Robespierre as a man and a politician, demonstrating quite conclusively how consistent his ideals and desires were, even predating the revolution of 1789 that made at least some of those ideas acceptable. McPhee doesn’t shy away from the fact that lots of people died in the Terror, but does point out that in no way can the majority be laid at Robespierre’s feet – he was horrified by the actions of some deputies in rural France. He also doesn’t shy away from the likelihood that Robespierre was in fact going too far, by mid-1794, and may even have been tending towards paranoia. If you’re at all interested in this period, or in how a leader can influence events, this is a really brilliant bio.